Father Frost is famous throughout Estara for his judgement of children, but with the growing wars, Father Frost has turned his eyes to the more sinister adults. It’s said that Father Frost has a soft spot for the Snow Sapphire, because his daughter once wore one around her neck. If you’ve been naughty, you better hope Father Frost will accept your Snow Sapphires and leave your blood unfrozen in your veins! Winning a battle in in Arena, PvP & Daily Campaigns will grant you Snow Sapphires. 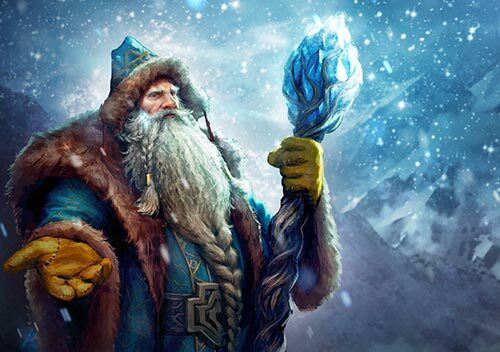 Winning with a Battle Boost below or Father Frost will grant you additional Snow Sapphires. Winterheart Chest: Used to upgrade Father Frost from Superior to Rare. The Frozen Cache will be available for 2 days after the event ends.And will have a chance at the Winterheart chest, Ice Boosters, or Ice Primus. There will be no leaderboard for this event.